Arthroscope is a small fiber-optic viewing instrument made up of a tiny lens, light source, and video camera. The television camera attached to the arthroscope displays the image of the joint on a television screen, allowing the surgeon to look, throughout the shoulder - cartilage, ligaments, and the rotator cuff. The surgeon makes small incisions around the joint area. In one portal, the arthroscope is inserted to view the shoulder joint. Along with the arthroscope, a sterile solution is pumped to the joint which expands the shoulder joint, giving the surgeon a clear view and room to work. Another portal is used for the insertion of surgical instruments to probe various parts within the joint to repair the damaged shoulder. 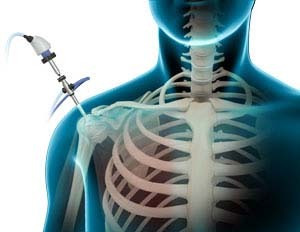 Arthroscopy is much less traumatic to the muscles, ligaments, and tissues than the traditional method of surgically opening the shoulder with long incisions (open techniques). Following the surgery, Dr. Patel may recommend you to practice certain measures for better outcomes. Pain medications will be provided, a bandage will be given around the operated shoulder which can be removed after 24 hours and dressings can be placed to cover the wounds. Slight swelling of the shoulder may be present after the surgery which is normal. Placing ice-packs on the shoulder for about 20 minutes, 3-4 times a day helps reduce the swelling. You can return to normal activities when you feel comfortable and a follow-up visit should be scheduled 10-14 days after surgery to monitor your progress.